Fact: 66% of cat owners obtain their cats for free. 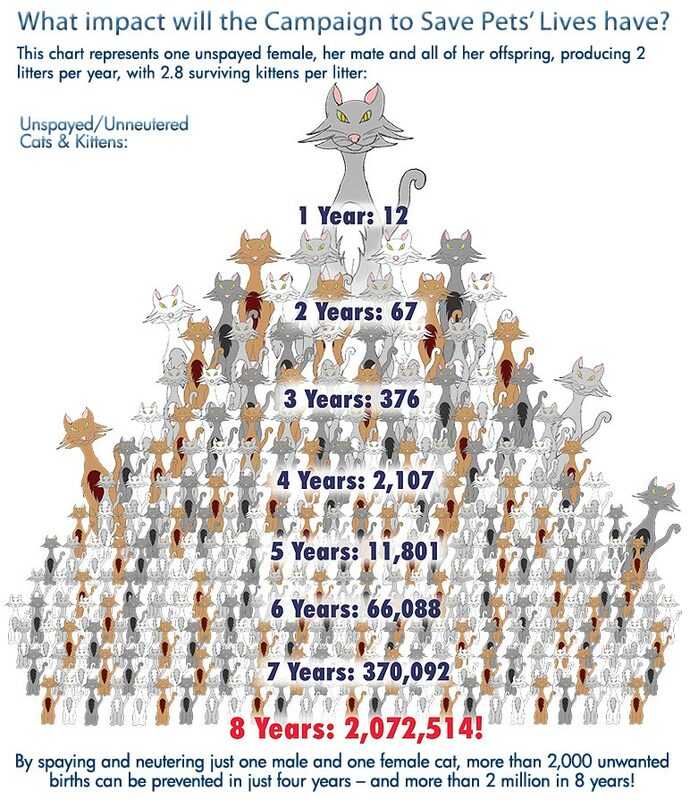 1/5 of cat owners don’t spay or neuter their cats, meaning 15% of Canadian cats will produce unwanted kittens in the coming year, adding millons more to the population. Not all these kittens will be lucky enough to find permanent homes. Many will join the ranks of the feral and stray cat population currently roaming the streets or dumps near you. For others, humane euthanization which is far better than a cruel death by disease, starvation, dog or coyote attack, or being struck by a vehicle. Based on statistics from animal shelters Calgary, more than 7,000 cats are taken in. You may say, “Oh that’s Calgary” … but you can equate those statistics those taken in by SPCA’s, humane societies, rescue groups, city pounds in Newfoundland and Labrador easy enough. On the island, rescue groups have had to spring to action to help cats which have grown in numbers. There are feral cat groups in Corner Brook, Conception Bay, Clarenville and other groups are trying to help the many cats in dumps throughout the island, i.e. in Glenwood for instance. There is a problem! The problem isn’t with the cats … it is with irresponsible owners. Solutions to these problems can be found through spay/neuter programs, trap s/n release programs, microchipping and municipalities insisting that owners keep their cats indoors. Central Paws Not only has taken in cats for rehoming, we have also helped spay/neuter cats that have been abandoned in barns who were feral. The abandoned cats were all rehomed and after adjustment period, now live happily indoors. We realize this is not a option for all ferals but was certainly a option for those we were able to help. Central Paws has also help spay/neuter cats owned by people on fixed incomes. This week we helped a young man neuter his cat, one that he rescued which was abandoned. Next week we are helping a senior spay her cat who has had multiple litters. All this helping cost money. All our organizations operate on fund-raising and donations, please be part of the solution and donate to our Spay/Neuter Fund. Central Paws is a Registered Charity. Your donation is tax deductible. (Statistics quoted from “Kitty’s reputation has gone to the dogs” by Terri Perrin, published in a article written in Animal Welfare in Focus published by the Canadian Federation of Humane Societies, Spring 2011). There is some great content in the following link from The Dog Fence. It is so important to make a lifetime commitment to any animal you decide to adopt and ensuring your lifestyle fits the type of animal is the first step. Do your homework and ensure you can afford the commitment as well, no excuses. We recommend opening up a separate account for your pet, put money you receive for gifts there, keep a jar on your counter to put loose change in … you’d be surprised how quickly you can put aside that extra emergency money … PLAN AHEAD. If you have to move, take the time to find a place so you can bring your pet … if you have to rent, offer a extra incentive to the landlord in the form of a security deposit, sign a extra agreement to repair/replace/have cleaned areas … ASK for help from organizations who may have contacts in the area you are moving to they may be able to provide some tips and advice. Life happens, make sure it includes your commitment to the pet you are planning on adopting. REMINDING PEOPLE … as cute as the little faces are in the Pet Stores and those you see photos of on sale on various sites, we plead that you PLEASE not purchase animals from Pet Stores. You will be contributing to the heartbreaking cruelty of so many animals endure that are bred in puppy mills and by backyard breeder. We would like to remind people, particularly those who go to their cabins, to keep their dogs on a leash and watched at all times. Make sure your pets wear a collar, you can get florcent stripped collars and those are great, don’t forget the ID tag. The following is some great advice from the Ontario SPCA on protecting your loved ones from Coyotes. Here also is a link to a story about a coyote at Beaches, Ontario and how the community residents petitioned to have him relocated rather than euthanized. What a great example of compassion and kindness … afterall we are in “their space”. One of the greatest benefits of microchipping. The following article certainly is testimony for the benefit of having your pets microchipped. Are you fwiggin’ crazy? Of course, you cannot put my letter on the web site as Santa’s elves might read it and I might get nothing but coal for Christmas. Then again, if anybody is going to get coal in their stocking it should be you for twisting Dusan’s wubber (rubber) arm into adopting Maddy! So I guess you can go ahead with the letter. Guess what? Maddy is back to himself and I’ve had to stop calling him names as he runs and tells Dusan and John. I think they secretly find it funny but they can’t let on! Speaking of the “toothless wonder” (Peaches latest and greatest nickname for Maddy)he is going to need more than obedience training. He needs a brain inplant! Just yesterday morning he chased away three blue jays and a squirrel from our bird feeder and then sat underneath it and stood guard! D’wesus Maddy, just ‘cause you got a dickie bird doesn’t make you a real one! Speaking of dickie birds, the rash on my tummy and my fluffy (you can guess what she means by that!) is getting all better. Dusan has been giving me a teeny bit of bread (which covers up the antibiotics) in the mornings covered with peanut butter. It makes you wonder why she took me to see Dr. Pike as if peanut butter and bread make me feel better why didn’t she just go to Sobeys? Sometimes I think Dusan is missing a few clues too! Oh, I’m getting sleepy now so I have to crawl back into my “nest” (a queen-sized bed) and see if I can’t catch some beauty sleep. It is not working for Maddy…he sleeps a lot too but certainly isn’t getting beautiful..hee-hee! About 5.4 million cats are killed by cars each year according to Animal People Online News, May 2001. This is about a million more than what are killed in U.S. animal shelters! Even the most careful driver can have a totally unexpected incident of a cat running out in front of their car and have to jam on the brakes. This figure alone is reason enough for me to keep my precious kitty inside. When we humans began to domesticate cats we took on the responsibility for their health and welfare. They depend on us for their safety and good health. Here are some other reasons why I think cat owners should consider keeping their cats indoors. Many outdoor cats are stolen by people who will sell them to research laboratories, or use them as bait in the training of fighting dogs. Psychopaths, and very sick-minded people will steal them to “practice” torture on. These types of low life people will pick your cat up right off your front porch or front lawn, especially if your pet is friendly. These type of people are out there. An indoor cat can never cause problems for your neighbors like urinating and defecating in their gardens. Many people who don’t like cats trespassing on their property will call the local animal shelter to remove your cat as a stray. Some cat hating neighbors will not even think twice about poisoning or killing your cat in whatever method they see fit. I personally have heard one man say matter-of-factly that he would “trap the nuisance cat in a cage and then dispose of it by lowering it to the bottom of the lake”. This is truly how some people think. Cat owners should never take a chance with their precious pets. Sicknesses are discovered and treated much sooner with indoor cats. There are several diseases outdoor cats can acquire as we’ve already seen. There is a very common condition called FLUTD (Feline Lower Urinary Tract Disease) that many cats, especially males, do get. The first signs of this sickness are straining and frequent trips to the litter box, sometimes with blood, and urinating in unusual places. For all illnesses it is important to obtain prompt medical care, but with FLUTD it is mandatory that your cat be treated immediately or he could die within 24 hours. Poisons. If you notice things like blood in the urine or stool, drooling and vomiting with blood, muscle tremors or high body temperature your cat could have consumed rat poison, snail or slug bait, antifreeze, have eaten toxic plants or even been bitten by a snake. You will never see early warning signs of many sicknesses and poisons with an outdoor cat.